Is US retail undergoing a meltdown or is there a problem far more systemic? US Retail is reeling with problems of oversupply where retail bankruptcies run amok. Through these blogs, we’ll undertake a principled exploration of what’s causing this seismic shift and understand some patterns that are emerging in this new retail world. Is reach and distribution the new black? Online retail’s high reach and improved ability to distribute information and goods at scale, enable user convenience at unprecedented levels (Let’s just admit that driving to a store to buy a pack of toilet paper isn’t fun, you’d much rather like it shipped to your doorstep). Now reverse logistics has added yet another powerful weapon in the e-tailers arsenal (You’ll get a pack of toilet paper with wet wipes and a return carton at your doorstep. If you don’t need the wet wipes you can just place them in the return carton and the e-tailer will take care of the rest). This changes targeting, product recommendation and re-targeting at a fundamental level. It’s psychologically harder to opt out than to opt in*. As internet’s penetration increases, the marginal cost of reaching a new user reduces further, while the online retailer adds millions of virtual product shelves to their offering. In spite of these clear advantages, there are many limitations that online retail has, like very *low conversion rates(<5%) compared to offline retail. Consider this: Online reach is easy, but CPG name brands are growing cautious about their organic reach. ROI on advertising spend becomes questionable due to many problems in online advertising, like low media transparency, frauds(humans v bots) and highly annoying repetitive ads. These issues are forcing biggest advertisers to think hard about media supply chain. What they strive for is mass one to one marketing, what they get instead is high frequency annoying ads on the wrong channels. There are many costs involved in the traditional commerce method, many of which however can be replaced by a few cost items like web hosting, way less manpower(way more skilled though), shipping. Amazon employs 566,000 people compared to Walmart‘s 1.6 million and Amazon is roughly 3 times as big as Walmart. Amazon which has a lion’s share of combined US retail market(~35%) is employing less than 10% of 6.5 mn people employed by top 15 US retailers. Apparently, Amazon reports way higher levels of return on human capital, take a look at the following graphs. Amazon, like most online retailers, has a problem of low conversions(5–7%). What makes one look the other way is the sheer number of people buying from Amazon and Amazon’s ability to distribute products at low cost through an unmatched fulfillment infrastructure. It still doesn’t answer, why the online retailer has low conversions? Offline retailers have a very high conversion rate in comparison(~25%), which in large is offset by supply chain’s expense and limitations. These limitations make the offline retailer way less agile. Which brings us to an interesting question — What if there’s a flexible, truly omni channel retail model where offline retailers are able to distribute through Amazon? And people come to stores for experiencing products? On the flip side, Amazon has successfully used e-commerce in modularizing distribution in a way incumbent retailers just couldn’t. To add to that, Amazon integrated customer data and payment information which fueled Amazon’s integration of distribution with user relationships. It is possible for Amazon to retain users, by precise targeting and retargeting with products which fit your bill and needs. This makes it’s low conversions far more attractive than experience driven offline retailers with much lower user retention. Amazon has done something which only the most innovative companies have been successful in pulling off so far, viz modularizing existing integrated value(distribution) and combining it with most important parts of the value chain(customer relationships). 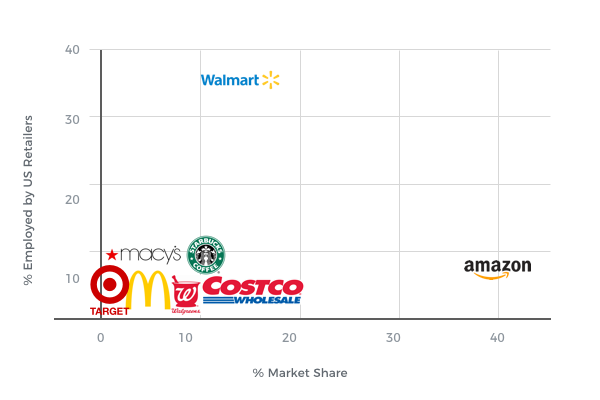 Taking a look at average CLTV of various retailers, it becomes evident that Amazon like distribution, and precise targeting reaps incredible results for the e-tailer. It still doesn’t answer what makes offline retail so special, that even Amazon couldn’t look the other way.